World War I (1914 - 1919) was a war that involvesthe majority of European countries. The war was a global military conflict centered on Europe. This war began in summer 1914. This conflict involved all of the world's greatpowers. There are two major forces that fight: the Allies (around the Triple Entente) and the Central Powers. This is a severe conflict. Killed millions of people, and injuring many people. Between Germany and France for the competition which left Franco-Prussian War. Between Russia and Austria for hegemony on the Balkan Peninsula. Between England and Germany by commercial and colonial rivalry. Political friction between Britain, France and Russia, due to colonial expansion respectively, which are also intense, but abandoned to make way for the setting of international alliances. To ensure that the results of their victory over the French, German Chancellor Otto von Bismarck designed the alliance system, based on close cooperation between Germany and the Austrian empire. In Italy joined this partnership, hostilities with France over the question of Tunisia, and the so-called Triple Alliance appeared. For its part, France looking for allies to support their desire for revenge. As Russia against Austria in the Balkans, the Franco-Russian alliance, which later merged with the English to realize the great power that is building Germany signed. Thus was born the Entente Cordiale Entente or. Two blocks antagonistic policy practiced indirect aggression; This fact increases the likelihood of a war broke out. The first occurred on the occasion of the establishment of French Morocco, against Germany. The cause of the war that broke out in the Balkans, the first between Turkey on the one hand, and Greece, Bulgaria and Serbia join again, and then defeated the Turks, among the winners to divide the spoils (1911-1913). Causes of world war is when the murder of Archduke Franz Ferdinand, heir to the Austrian crown, occurred in Sarajevo (June 1914), by a Serbian nationalist organization "Black Hand". Austria would like to take the opportunity to destroy Serbia, Germany supports this policy. Then Russia declared war on Austria, while Germany did to Russia and France. As shown, the overall performance of a conflict alliance release. 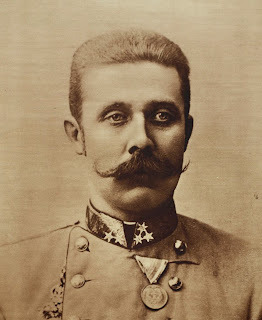 Detonator or pretext for the start of the First World War: The murder of the heir to the Austro-Hungarian Empire, Archduke Franz Ferdinand of Austria. The countries fought the First World War is the first group includes the Central Powers; Germany and Austria-Hungary, along with Turkey and Bulgaria, and the second group consists of Russia and France with Britain, Belgium (invaded by Germany), Italy (which is releasing the Triple Alliance was betrayed by the Germans to support the pretensions of Austria in the Balkans are also coveted by Italy), the United States and Japan. - It began with the German invasion of Belgium. Germany invaded and occupied Belgium. Italy breaks alliance with the Central Powers. - Invasion of France, Germany moved to France led by General Von Kluck, but was stopped by the French General Joffre at the First Battle of Marmo. - Battle of the Ditch: France developed a war of attrition against the Germans by a trench that stretches from the western front, with parallel lines, from Switzerland to the North Sea. - Lock the Central Powers. France and Britain set a blockade of Germany. - Undersea Warfare. Faced with the size of the Allies, Germany declared war zone, the seas around the British Isles, in order to ensure the supply of raw materials for the industry. There is then the Lusitania sinking American ships that determines the entry of the United States in the war. US to intervene to protect the rights of international trade and investment and overseas. - The defeat of Russia on the Eastern Front. Russia withdrew from the war, losses suffered by Germany and the victory of the Russian Revolution (Bolshevik Revolution), are required to sign the Treaty of Brest-Litovsk. Germany launched a counter-attack ground. French siege occurred, but Germany was defeated in the Second Battle of the Marne. - November Socialist Revolution in Germany will force the release of Kaiser Wilhelm II (the end of the German monarchy). The interim government wont armistice was signed in the Forest of Compiegne who will end the war. - During World War killed about 9 million people (civilian and military). The number of casualties among civilians and military reach around 30 million. - Strengthening of the United States on the world stage of political, military and economic. - Creation of the League of Nations (also called the League of Nations) to ensure world peace. - Signing of the Treaty of Versailles imposed a series of sanctions on defeated Germany, which will be Revanchism German origin, causing the outbreak of the Second World War. - Development of various weapons of war, for example, tanks and aircraft. 0 Response to "History of World War I"